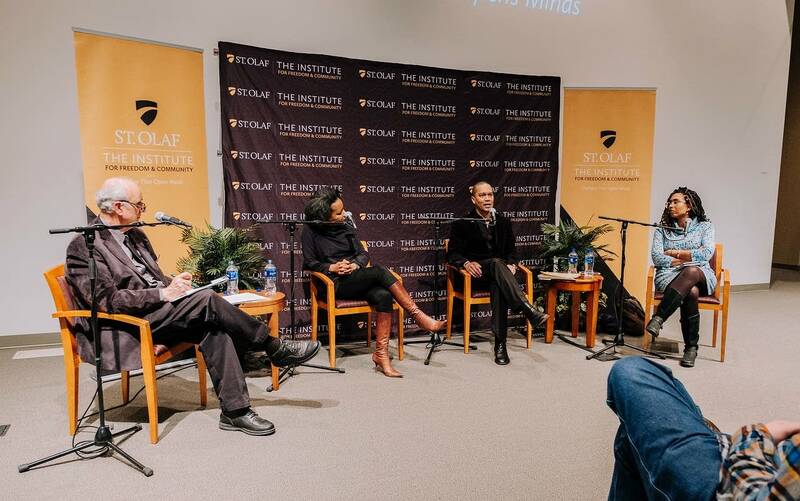 A discussion from the St. Olaf College Institute for Freedom and Community: Three professors of differing views came together on Martin Luther King Jr. Day in Northfield, Minn., for a forum called "Race, Immigration and the American Dream in the 21st Century." Is America the land of opportunity — and equality for all? What does American society owe to those who don't make it? Christina Greer, associate professor of political science at Fordham University. Author of "Black Ethnics: Race, Immigration and the Pursuit of the American Dream." Jason D. Hill, professor of philosophy at DePaul University. The author of four books, including "Civil Disobedience and the Politics of Identity: When We Should Not Get Along," and "We Have Overcome: An Immigrant's Letter to the American People." Leah Wright Rigueur, assistant professor of public policy at Harvard University's Kennedy School of Government. Author of "The Loneliness of the Black Republican: Pragmatic Politics and the Pursuit of Power." The event was held Jan. 21, 2019, at St. Olaf College. The moderator was professor Edmund Santurri, director of the Institute for Freedom and Community at St. Olaf College in Northfield, Minn.